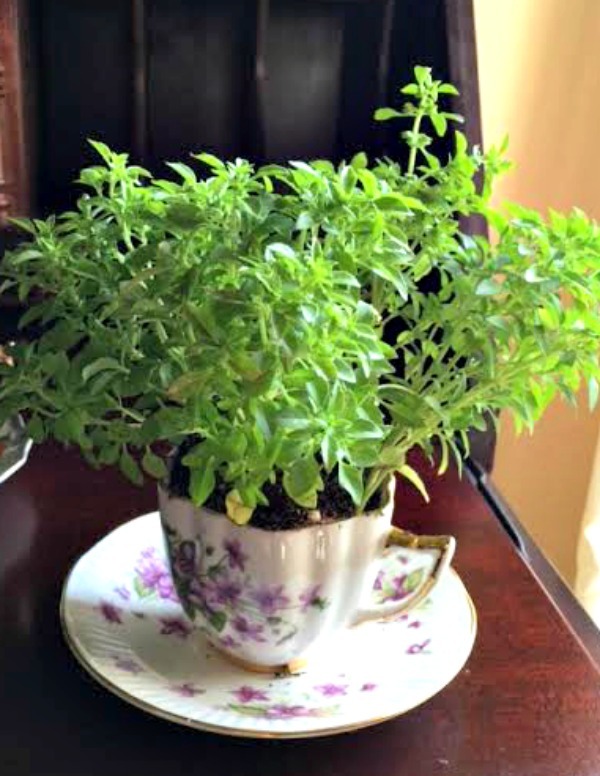 If you are looking for an easy gift idea for Mother’s Day, take a look at this lovely teacup herb garden we created. When I spotted these lovely teacups at my favorite Goodwill of Orange County store, I knew I had to have them and find a way to display them. Not only do they look so pretty, the aroma is amazing. I have used some of the herbs in my cooking already and plan to freeze some of the leaves to use later. If you have a tea cups and saucers, all you need is a quick trip to your favorite home improvement store for the herbs. I chose peppermint, oregano, cilantro, basil, thyme, and mint. You can have the kids make homemade plant markers out of popsicle sticks, or you can use small silver spoons and permanent markers as an added embellishment. Everyone who saw this DIY craft just loved them! These would also make charming favors for a brunch or shower, or as a teacher appreciation gift. If you cannot find pretty teacups, look for coffee cups or small decorative jars. 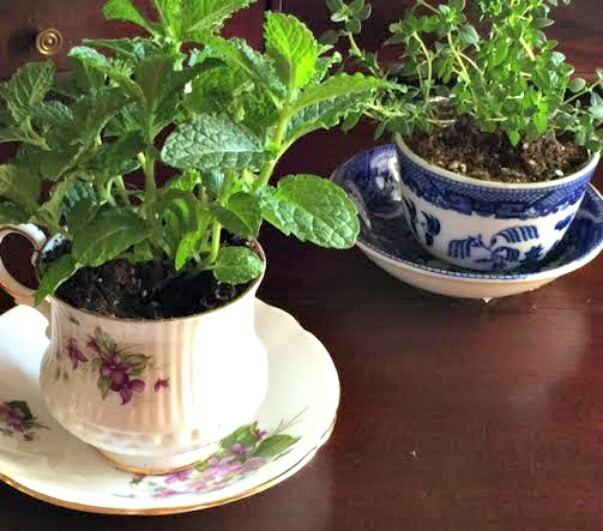 With just a little imagination, you can repurpose so many items found at thrift stores and garage sales into lovely DIY gifts. 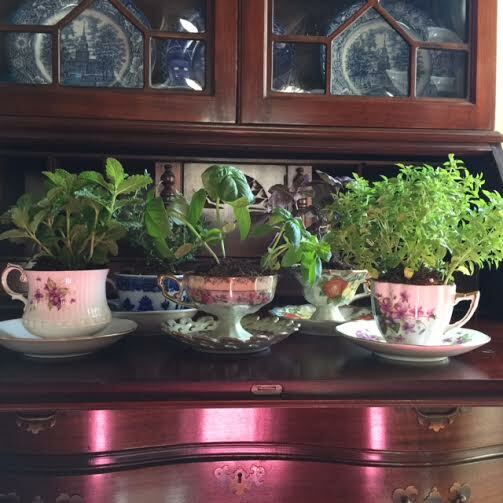 Because the teacups don’t have any drainage, they should be misted every other day to keep the herbs alive and fresh. A sunny kitchen windowsill is a great spot to enjoy them and to snip off a little sprig to use in your cooking. If you have more time, you can grow your herbs from seed. I recommend a dry soil with a thin layer of fine gravel on the bottom of the cups. Be sure and keep the soil moist with a sprayer. You should see growth in 1-2 weeks. 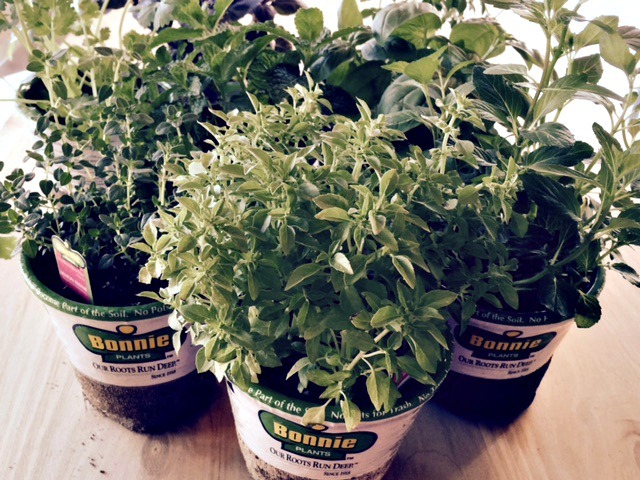 What do you think of our handcrafted DIY Mother’s Day herb garden? What are your favorite herbs to use in the kitchen? Join us on Pinterest here where we share hundreds of projects from crafty bloggers. Are you making a DIY Mother’s Day gift this year?